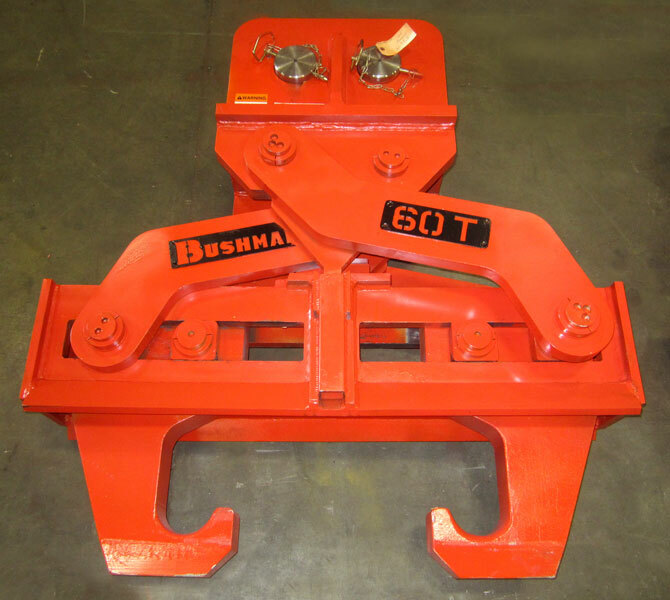 Bushman Equipment, Inc. designs and manufactures a complete line of tongs for lifting and moving a wide range of industrial loads. 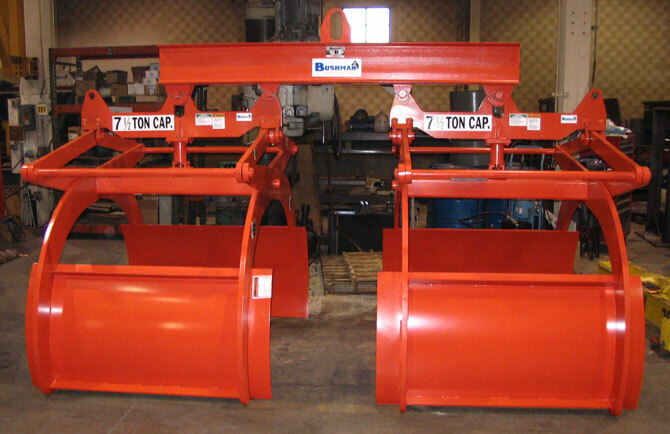 We design each tong for the size, shape, weight and special conditions in your particular application. 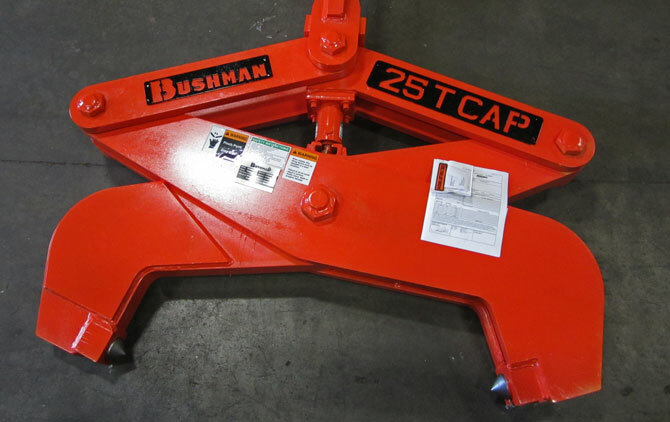 Bushman Equipment, Inc. lifting tongs are designed and manufactured according to the latest revisions of ASME Specifications B30.20 and BTH-1, Design of Below-the-Hook Lifting Devices. 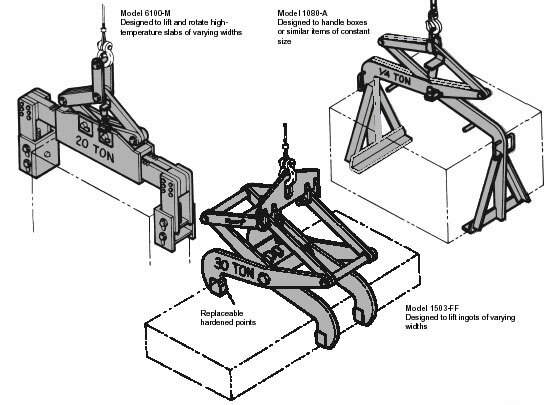 Supporting tongs are for single-size objects that have support clearance underneath, such as boxes, crates, bins and containers. The lifting feet of the tong support the load and maintain it on a horizontal lifting plane. Gripping tongs are for materials such as ingots, rolls, tubes, pipes and other round or cylindrical objects. The tong extends beyond and below the center of the load to provide additional support. The diameter of the load may vary by approximately 25%, but the variation in length is generally unlimited. 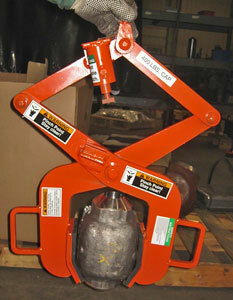 Pressure tongs grip the vertical sides of slabs, bales, boxes, billets and other flat or round objects. 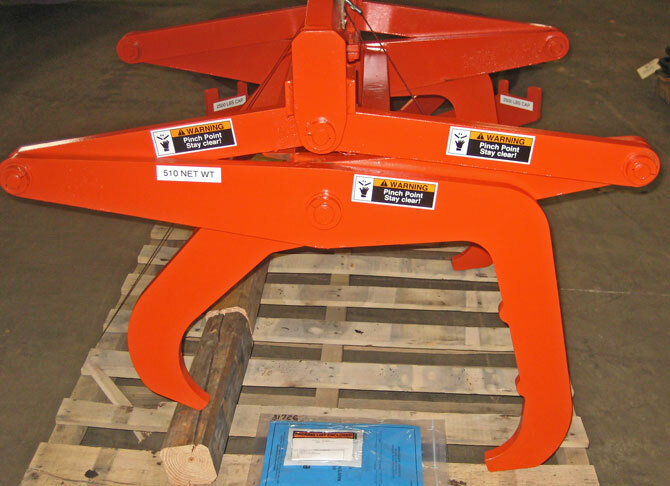 Pads on pressure tongs provide surface friction or penetration of the load to maintain a safe hold during handling. Pads can be provided with rubber, belting, pins, hardened points, serrated bits and other materials. With the lift open, position the tong over the load. Lower the tong onto the load. With the lifting tong resting on the load, and hoist tension released, the latch automatically disengages from the locked open position. Raise the hoist to allow the tong pads to close onto load. Then lift and move the load to the desired location. To release the load, lower the tong grab and place the load on the ground to relieve tension. The latch will automatically lock the tong in the open position. Then raise the hoist to remove the tong. 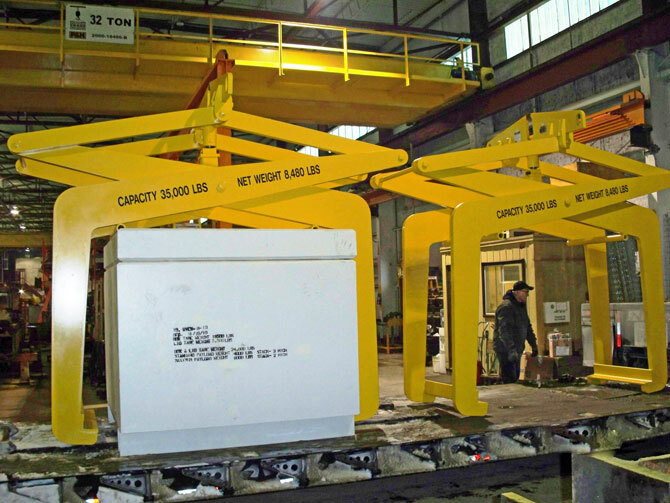 This 60 ton die lifting tong handles automotive dies. 1,200 lb. 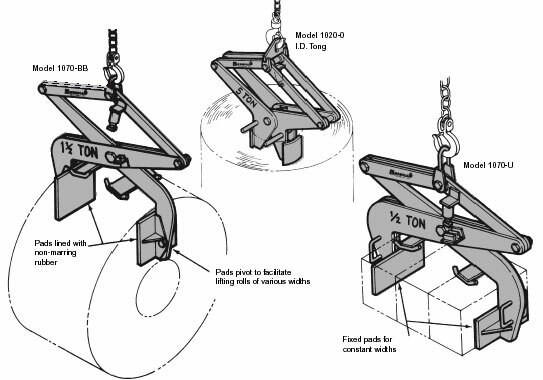 crate lifting tong. Left: 6 ton 3-leg tong to lift under a flange of a welded structure. Right: This three-leg tong lifts barrels from under the top lid. 35,000 lb. tong to lift concrete vaults. 400 lb. 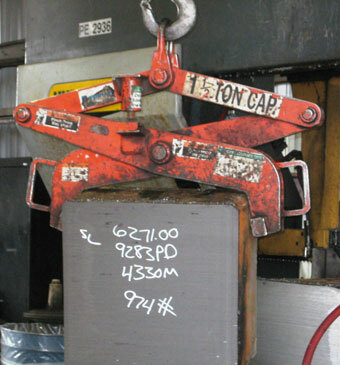 tong to lift irregular shaped castings and forgings. 1,500 lb. tong lifts machined shafts. Replaceable rubber gripping pads prevent damage to the shaft. 200 lb. tong handles off-road vehicle exhaust components. 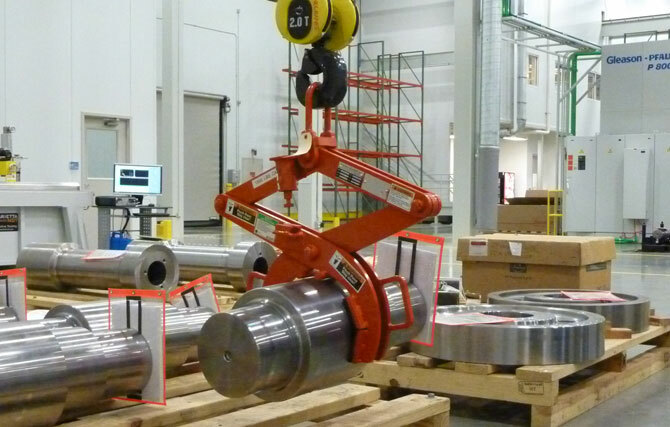 Ergonomic handles aid the operation in positiong loads. Twin 7.5 ton paper roll tongs attached to a spreader beam. Three 9,500 lb. 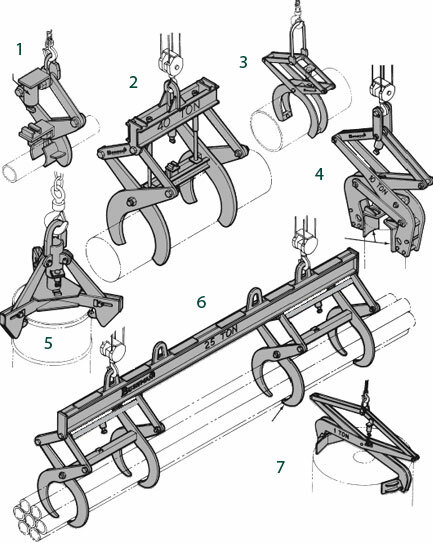 paper roll tongs attached to a spreader beam that attaches to two crane hooks. 15 ton single mill roll tong with chock stabilizers. 35 ton adjustable double mill roll tong. Tong that grips non-concentric pieces. 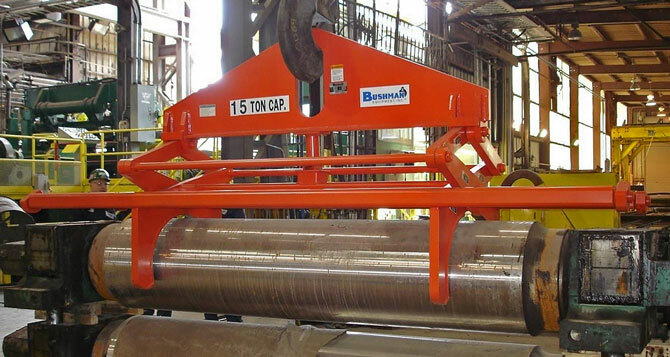 Pressure tongs handle bales, boxes, ingots and other flat or curved-sided objects. 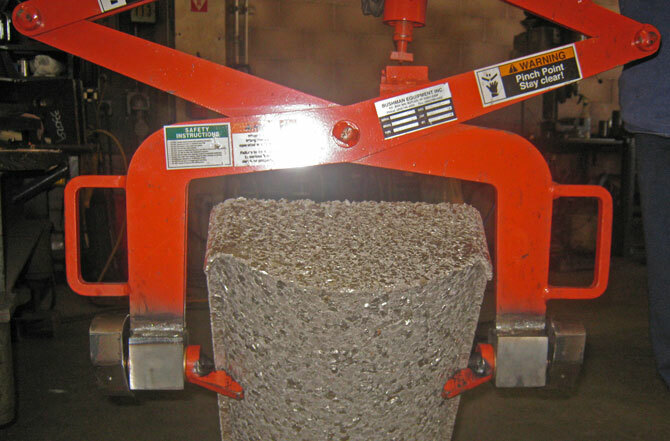 Pads provide surface friction or penetration of the load to maintain a safe hold during handling. The pads can come with rubber, belting, pins, or hardened points. Left: 2,000 lb. paper roll tong. Right: A Paper Clamp is used by a major paper mill. 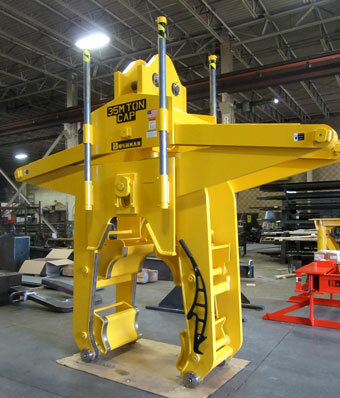 5 ton pressure tong designed to operate from a crane or a fork truck (see fork pockets). 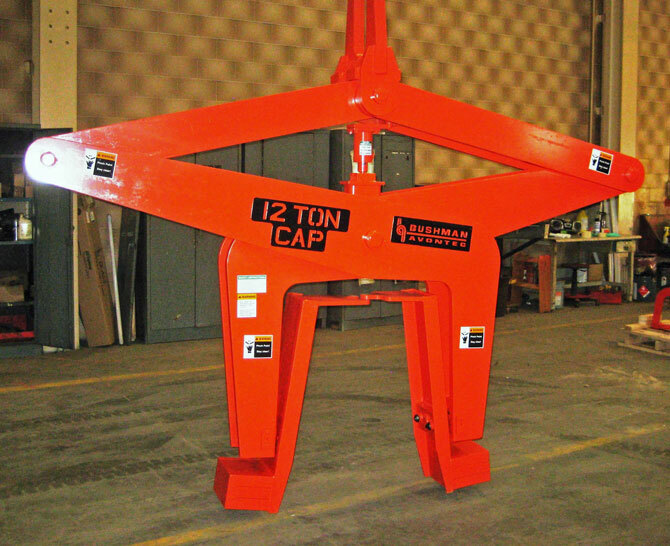 Left: 2 ton bale tong uses steel points to penetrate the load surface. Right: This pressure tong holds aluminum scrap blocks. 1,500 lb. tong lifts gears and gear blanks in a machine shop. 3,000 lb. tong uses hardened steel points or diamond knurled pads to lift billet sections. 25 ton billet tong with hardened steel points. Left: 90,000 lb. ingot tong grips hot ingots horizontally. Right: In addition to the cylinder of bottled gas shown here, these vertical tongs can handle loads of differing lengths. Ingot or billet laydown tongs grip and lift vertically and can safely lay down the load to its horizontal position. This tong lifts an irregular shaped piece and allows it to rotate to horizontal. 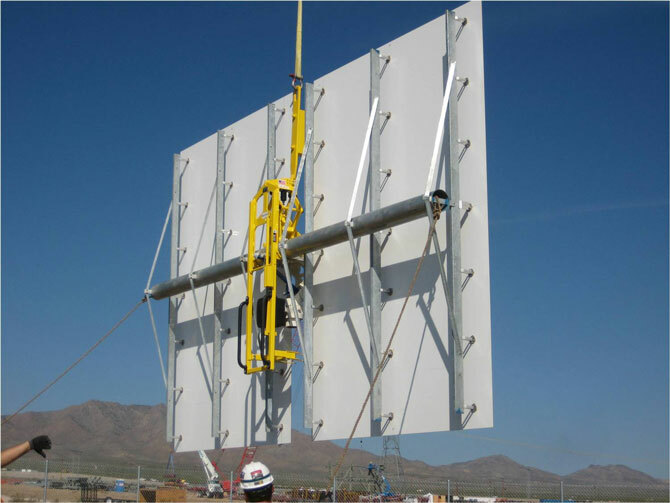 Bushman can design tongs for unique applications, such as this tong that lifts & sets glass solar reflector mirrors onto pylons at a solar-thermal power plant. Model 1029-E lifts light weight, short round shapes. 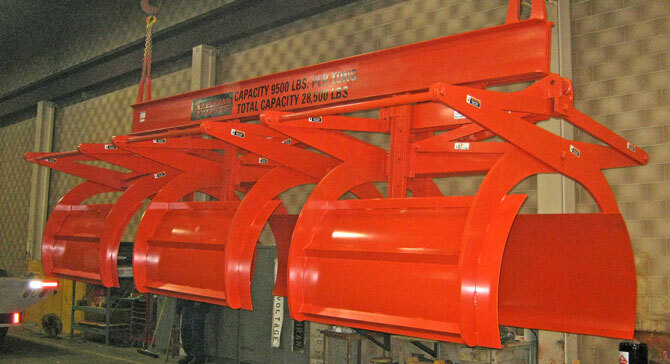 Model 1529-D lifts heavy, long, round shapes. 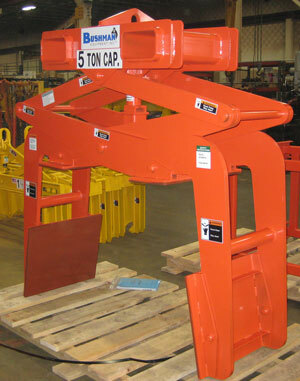 Model 1529-M lifts heavy, short, round shapes. Model 1570-K with rotating pads lifts vertically; lies down horizontally. 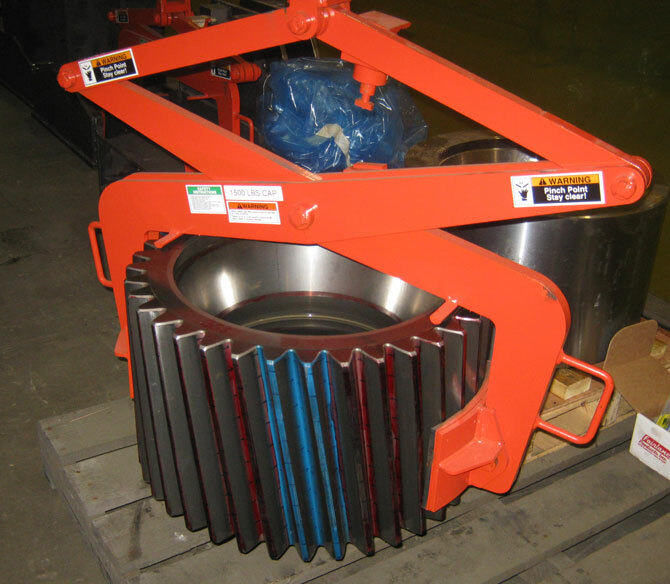 Model 1030 Drum Lifter lifts vertically. 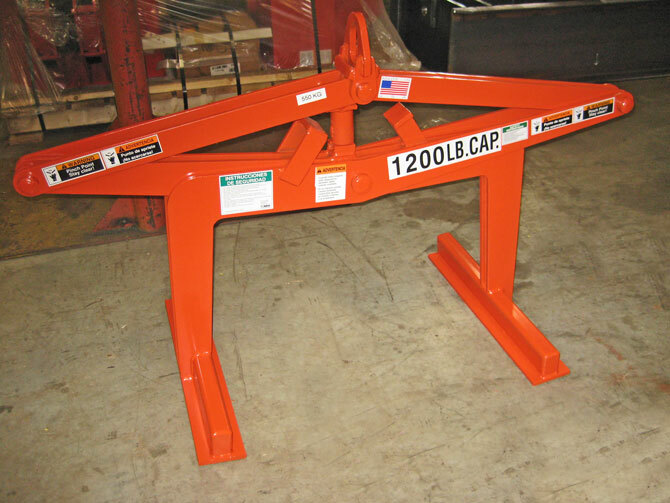 Model 1529-D is a lifting beam with two tongs for long loads. The legs are designed to lift bundles of pipe and bar. 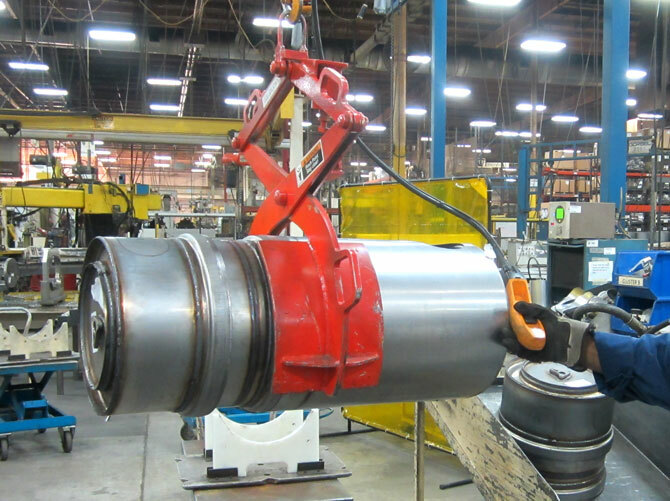 Model 1070-0 is a pressure tong that lifts round loads vertically.